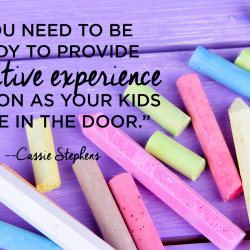 Getting help from your specials team or other colleagues, why observing classroom teachers can be worthwhile, and how to deal with kids one-on-one when dealing with behaviors. Full episode transcript below. Cassie: I was recently asked a question on Instagram, and I thought it was such an awesome question that I wanted to devote a podcast to … episodes to it. The question was about challenging behaviors in the art room. This art teacher mentioned that she has a class, a particular art class, with about five students where their behavior is causing her to spend more time with consequences and redirection instead of art class, instead of teaching them and enjoying the creating experience. I thought, “Man, I know I have been there.” In fact, I have classes right now where I do feel as though I devote more time to redirecting, reminding them of the task at hand than I do actually letting them have fun. I think that all of us teachers have classes or maybe our whole day could possibly be like that. So, what do you do? Let’s talk about that today. I’m going to share with you some things that I think might help you if you have a class like that. But just know I’m coming at you from classes that I struggle with. I think that the key is when you’re seeking advice from other teachers, just know that take a deep breath. We have all been there. 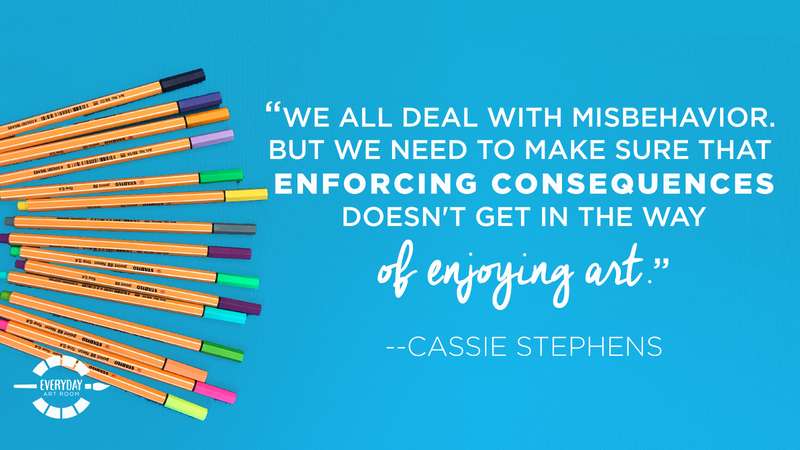 Managing student behavior is something that we all struggle with, and we all try to strike a balance with, the best that we can as far as our teaching philosophy goes with our students in our school environment. I’m Cassie Stephens, and this is Everyday Art Room. So what do you do when the literal joy is being sucked right out of your art class and the entire class is suffering because you have to play the mean and rotten art teacher constantly redirecting and reminding that group of kids that are just driving you bananas? I think this is what you got to know: You are not alone, number one, and you have got to learn how to read your audience. By that, I mean this. I have a fourth-grade class that I adore. They are hilarious. However, I can only take the hilarity to a certain point before I know that there is no coming back, that they are just gone. And my style of teaching, I can get a little crazy. If you’ve ever watched a couple of videos, I really enjoy teaching in that style. It’s all fun and games until you have a class that doesn’t know how to reign it back in. My third graders, oh my goodness, we can have so much fun and I’ll be like, “Okay, the show’s over. Get back to work,” and they snap to and they go right back to work. That would never fly with my fourth-grade class. So sadly, with my fourth graders, I’m not able to ramp it up to the silly level that I would love to because I just know that they can’t handle it. I think that being able to read your audience will really help you as an art teacher. It stinks because sometimes I feel like my students are looking at me, my kids who’ve had me since kindergarten, man, it used to be really crazy and fun in here. I don’t want to say, “Well, yeah, but now I know y’all can’t handle it,” but it’s the truth. As long as I’m still serving up that content, as long as they’re still creating, then I’m still giving them that art experience. Now, all that to say, maybe they’re not even mature enough to handle certain art supplies, and that’s okay, too. If you’ve got a group of kids who you’re constantly having to redirect and you just are dreading the notion of having them paint with tempera paint because you know they can’t handle it, teach the same lesson but with watercolor paint. Teach the same content, but dial it back some for your sanity sake. Otherwise, it just becomes a class of what I call the stop-quit-don’ts. Nobody enjoys a class where the teacher is constantly saying, “Stop, quit, don’t,” and nobody likes to be the educator that’s doing that either. Speaking of that, I have noticed that when I am saying a lot of stop, quit, and don’ts to a class, it’s usually because my patience has run out. And I noticed that when they start hearing that, they stop listening. So if you find that you are focusing on that group of those five kids with a stop-quit-don’t kind of vocabulary, read your audience, switch gears. If it’s not working, then stop doing it. Switch gears and start more with the praise. Even if it’s some little thing that they’ve done, praise them. Then, praise the daylights out of the kids who are doing a really good job. I’ve noticed that when my vocabulary switches from negative words, like don’t and stop to positive words, like, “Wow! look at that,” suddenly the mood changes in my room. So, read your audience. It’s okay to teach in a different style, to use different materials. Definitely switch up your vocabulary with these kids. The other thing that I would recommend, now that you know that we’ve all been there, myself included, I think it’s really important to talk with other teachers. I would start by talking with your specials team. I’m really tight with my specials team. In fact, we have a common coffee pot that is in my art room, and every morning we have a little chit chat session and we talk about stuff. We talk about certain classes. What are you doing that so-and-so acts a certain way in my room, in art class? Do they do that in physical education? Do they do that in music? Surprisingly, you will learn that students don’t do that in other classes. Why? I have found that my really active kids, the ones who just can’t sit still who are sometimes a struggle for me because they’re like whack a mole, they’re like up and roaming my room, are amazing in PE because they do have all of that energy or they have this beautiful, incredible singing voice. If they’re constantly tapping their pencil, the music teacher loves them because, hey, they can keep a steady beat. It’s wonderful to talk with those other special teachers because you can learn from them how the kids behave in a different environment. Take what you learned from that. And maybe then, if that kid is always up and wandering, allow them to do so. Hey, do you need to go walk around the room? Can you get up and go sharpen some pencils for me? Do you need to tap something out? Why don’t you go tap something out on a table where you’re sitting by yourself so it’s not distracting your neighbors? Then you can tap all you want. Or give them something that they can squeeze or manipulate. But, it’s oftentimes really helpful for me to find out how these students behave in other classes and how the teachers are remedying that behavior or maybe thriving with that kind of student behavior. Another thing that I would definitely consider doing if you have a group of kids or a class that you’re struggling with is I would definitely talk to classroom teachers. Go to that classroom teacher. You know your classroom teacher friends. Some of these classroom teacher friends are going to be so open, and willing, and wanting to help you. I have a couple of classroom teacher buddies that if I go to them with a student who even looks at me sideways, they’ll have that kiddo sit down and write me apology note and bring it to me and we’ll have a little heart to heart. Then other classroom teachers, they’re swamped. They’re busy. Their philosophy is, if the child is in your room, then, therefore, it is your issue. I don’t love that philosophy at all. I think that all of our kids are all of our important little diamonds that we’ve got to polish and work together to make that happen, but that’s neither here nor there. Talk to those classroom teachers, though, and just see, what do they do? How are they helping those students if those students are even acting this way in their room? Which can also be very enlightening if they are not. I would also ask to observe classroom teachers. I know that there are so many amazing teachers in my school. I see them in the hallway with their students and I just think, “Gosh, those kids are just magic under their teacher’s watchful eye and their direction. How is he or she doing that?” If you’re curious about that, if you’re looking for a little guidance as far as classroom management goes, I would definitely seek out an unofficial mentor. You might already have a mentor in your school. I know at my school new teachers have a mentoring program, but I would definitely find somebody and just say, “Look, I really admire you as a teacher. Do you mind if during my planning I just come in and I sit and watch? I just want to know what it is you’re doing that’s really impacting these kids in such a positive way.” Flattery goes a long way, y’all. And it’s so amazing to go in and just see how those teachers work their magic. I would also recommend … And in my district, we have to do this. I would recommend seeking out some other art teachers to go and observe, another art teacher in your district or just somebody close by. I would ask if you could just spend a day, a whole day just soaking in how they run their classrooms. If you came to my room, you would see all the many flaws that I have, and you would definitely learn what not to do. That’s what I always tell people when they want to come and observe me. I actually hate having people in my room observing because I just feel like I’m under a microscope. But, I understand all the things that they can take away from it as far as what to do, and like I said, what not to do. You can learn a lot by watching teacher, by watching the non-examples of teachers. And of course, if you’re in a place where you can’t go and observe other art teachers, there’s always social media, just reaching out on any of the Facebook art teacher groups or even on Instagram. I find that the Facebook art teacher groups can actually be more helpful with this kind of situation since you’re going to want to explain the situation. You’ll be amazed by the amount of people who will have great tips and tricks, maybe some websites for you to check out. I think that that can be so helpful, also. All right, now let’s talk about classroom management tips. 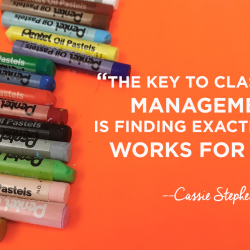 So now that you know to read your audience, you know that we’ve all been there, and finding and mentor is key, let’s talk about some classroom management tips. I think that the biggest issue when it comes to behavior in your classroom, a non-desirable behavior, is you’ve got to get to the root of the problem. Why are these kids or why is this particular child acting out? What’s going on? Because just slapping a bandaid on it and just making it through that 30-minute to 60-minute art class, next week here they come again and they’re back to acting just like how they were. So, the key is going to be to kind of get to the root of the problem. And focusing on the behavior as if it’s something that’s removed from the child and not the child is really important. Because a lot of times, I think kids either they feel like they have been dubbed the “bad kid.” I’m the bad kid in art. I misbehave in … I just am the bad. I act out. But pulling them aside and away from their peers, especially if you’re talking about older students, even younger kids, you can … Talking to them about this, having this conversation with them about this in front of their peers is not a good idea. 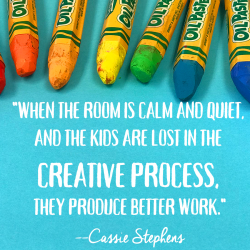 So if you find that you are struggling with a kid, pull them aside either after class or even seek them out at a different time when art class is over and ask their teacher if you can have a chat with them in the hallway in private. And just ask them, “What is going on? Because your behavior is making me feel,” I’m going to put words in your mouth, “sad, upset, bothered, and I want to know why you’re behaving this way because I really like you. I really love having you in my class, but your behavior is making it difficult for me to enjoy teaching my art class. So, what can we do?” So, focusing on a really certain language, making sure that the child knows that they are loved, they are cared for, you are thrilled that they are in your art class, but their behavior is making it difficult for you to teach and for them to enjoy the art experience. You might be interested to hear what they have to say. I mean, I’m sure you’re going to be interested, but you might be surprised is a better way to put it. Perhaps who they’re sitting with is bothering them. Maybe they’re getting bullied. Maybe they, like I said, have a lot of energy. They need to move around. From there, the two of you could possibly come up with a solution. Now, all of the sounds well and good, but now’s the time when you, if you’re having this conversation with a student, to start writing things down. “Okay, you and I have just agreed that our solution is going to be if you need to get up, you can walk around the room. Our solution is going to be you’re going to sit with other people who you won’t be as distracted by.” Write those things down and let them know this is what we’re coming up with. But then, you’re also going have to remind them of your consequences. “Just a reminder, we’ve now established this. If this doesn’t work and you go back to those certain behaviors, these are the things that I am going to have to do as a teacher to make sure that you are still being educated in art class, as well as the other people in the room. The first consequence is,” and you can just go through what your consequences are. In my room, a consequence looks like taking a break. I have a guidance counselor in my school. She calls it the think-about-it chair. In my room, my kids they just go take a break by sitting on the floor where we give instructional time. I just remove them from their table, from their supplies, and I just have them take a little breather. I don’t make a big production out of it. I just say, “Hey, so-and-so, can you go take a seat on the floor for a couple of minutes, please?” and we just leave it at that. Then, what is your next consequence going to be? Is it going to be having them visit the office? Is it going to be calling a parent? Make sure that once you and whoever this student or students … I would never address a group of students, by the way, about this. I would definitely talk to each one one-on-one. But let them know this is our plan for your behavior and these are the consequences. Having that really spelled out is going to help. If your school has a school set of rules … For example, our school, we are the Johnson Tigers, and we have a ROAR philosophy. ROAR for us stands for that we are always respectful, organized, always safe, and responsible. These are pretty simple, basic, and broad, but making sure to tie in the school rules will also be helpful to you. I would also definitely make sure that once you come up with this little plan you chat with the classroom teacher just to give them a heads up. You might want to clue your specials team in case they are struggling with these students, too. It can be something that you all work on as a team. And I would also chat with my admin, especially since … or especially if you’re putting in the whole “you have to go to the office” deal in your little … I don’t want to call it a contract because you never want to have a student signed something that, of course, a parent isn’t well aware of. But for lack of a better word, the contract. In my room, a class helper would be called an art teacher in training, meaning if I need anything if I need … I don’t know, I’ll even make stuff up. “Hey, can you bring me a Sharpie? Oh, I’m going to need you to sharpen the pencils for me. Hey, can you go do X, Y, Z? Can you empty water cups?” Granted they’re still going to have enough time to create, but when they get that little bit of movement going in them and I know they’re going to need time to get up and move, that’s when they become my art teacher in training. A lot of times, these students who have a lot of energy and have never been taught how to channel it positively have heard a lot of negative things. They already come in with that like a dog with their tail between their legs kind of mentality. If you can lift them up, if you can make them feel so special and have them channel that positive energy, they will love you for life. In fact, a lot of times those students of mine will wear a special apron if they are my art teacher in training. I will also little jobs could be class DJ. I always have a class DJ who’s in charge of turning the record player on, turning the record player off. That’s a big deal. I have a class sheriff who I have a little badge from the dollar store. They wear the little badge and they just walk around, remind people at what level we’re working at as far as voice level goes. So, they’ll walk around and they’ll just gently remind them once or then come talk to me, but the deal is they have to be a nice sheriff about it. Or just even something simple as the lights person, or the class scorekeeper for the happy-sad board, which I know I’ve mentioned previously. Giving out little jobs to those kids who have energy will get you to not hop on the stop-quit-don’t train with them, and it’ll also make it so they’re feeling important because they are. You know that whole, “Hello, my most amazing artists” routine that I do with all my classes? Unfortunately, if I did it with this particular class, I wouldn’t be able to calm them back down again. So, I kick off my class with those particular groups of kids in a lot more calm kind of fashion because I’ve learned to read my audience. So, you might want to think about that. Think about how you can change your environment to make it a little bit more calming for them when they walk in. Also, I read to them a lot. I know I’ve been talking with you guys about that quite a bit. You know, I read Shel Silverstein to them, but something that my boys have really loved listening to lately are Choose Your Own Adventure books. I’ve noticed that kids who I have had a hard time connecting with are now so in love with just sitting, creating, and listening to me read those books to them. I’ve also noticed that having a smooth transition will also prevent the wheels from falling off your bus. For me, usually, it’s cleanup or even just us leaving the floor and getting our supplies and creating. If you can create those transitions, if you can smooth them out, then your class flow will continue to be smooth. I oftentimes will make it into a contest. Let’s see who can go gather their supplies better, boys versus girls, or warm color tables versus cold color tables. I don’t have a prize. There is nothing that they win. I mean, you might want to come up with something, but just the word contest, they’ll automatically switch into, “Okay guys, we got to do this quietly.” It’s hilarious. But, making sure that you have them moving maybe in smaller groups also will help. Instead of having a group of 20 to 30 kids up all getting their supplies at once, having half of that moving and then maybe the other group can go get their aprons on. But, smooth transitions will also help. And in the end, I think it’s important, have a plan, a solid plan, whether it be one-on-one with those particular kids. Maybe your plan is reviewing the rules and the consequences again, letting the kids know your plan and stick with the plan. Stick with it. That’s what’s really going help make your classes run a lot smoother, be a lot better, and hopefully knock out some of those classroom behaviors that you might be having. Tim: Hello, this is Tim Bogatz from Art Ed Radio. 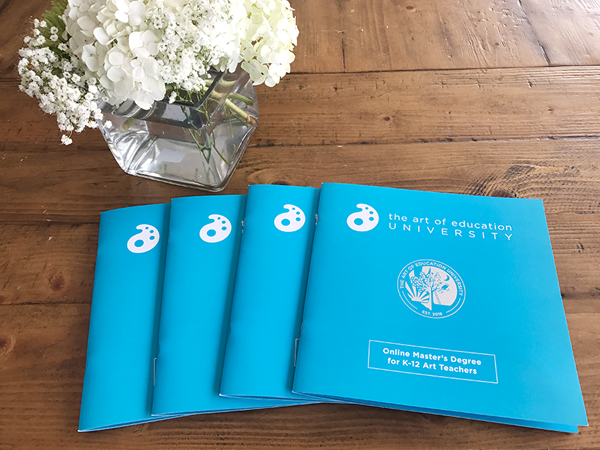 If you’re enjoying this episode and want to learn even more about having better classroom management, you might want to consider The Art of Education University’s Managing the Art Room graduate course. Managing the Art Room is a three-credit-hour course that runs over eight weeks, and it helps you create a unique blend of strategies and techniques to hold students accountable, manage materials and resources, design procedures to keep the art room running efficiently, and established an enjoyable, creative environment. You will walk away from this course with an understanding of several comprehensive management strategies. You will also receive support from fellow art educators as you identify key classroom management struggles and learn to turn them around. If you are interested in learning more, please check out theartofeducation.edu/courses. Now, let me turn it back over to Cassie and she finishes up the show. Cassie: In the end, I think it’s important to know that … I mean, I’ve been teaching for 20 years and this is something that I’m still struggling with. I still struggle with daily. I’ve found what works for certain classes and what works for some kids, but just know that there is no formula that’s going to work with everybody. Not all of our little artists are exactly the same. Thank goodness. So, getting to know them as a person, getting to know how they tick, what they respond to, why are they acting this way, what is it that they need, they need an energy outlet, they need a calmer environment, they need to sit with a different group of people, figuring that out and also, of course, removing yourself and your feelings from the equation. Don’t take it personally. Instead, take what is hurting your feelings. Change that focus into finding out a little bit more about your kids and what’s going to work best for them. Have a great week, guys. And just know you are doing awesome.